Geneticist Mike MacNeil reviews Line 1 Hereford breeding data collected since 1934. The term “genetics” is everywhere these days—in human medicine, animal and plant health, and basic research. But long-term studies on genetic selection and linebreeding of cattle have been ongoing at ARS’s Fort Keogh Livestock and Range Research Laboratory (LRRL) in Miles City, Montana, since 1934. 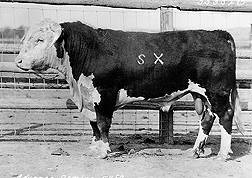 The year 2009 marked the 75th anniversary of the founding of Line 1 Hereford cattle. Today, Line 1 has been closed to the introduction of other germplasm longer than any other identified line of beef cattle. Line 1 Hereford cattle have been at the forefront of beef cattle breeding research. During the 1930s, success with hybrid corn sparked the development of many inbred lines of livestock across the United States. “Line 1 was created as a way for cattlemen to capture heterosis—or hybrid vigor—and produce a consistent product by crossing inbred lines,” says LRRL geneticist Michael MacNeil. “But this vision was never fulfilled and has since been largely supplanted by crossbreeding. Today, the Hereford-Angus cross female is widely viewed as one of the best females available for commercial beef production.” In large part, because of heterosis, these crossbred cattle have high fertility, are long-lived, and thrive in temperate regions. Advance Domino 20, a son of Advance Domino 13, from whom all Line 1 Hereford cattle descend. Line 1 was founded in 1934 from two sons of Advance Domino 13. These bulls, Advance Domino 20 and Advance Domino 54, were purchased from Fred C. DeBerard of Kremmling, Colorado, and bred to 50 cows purchased from George M. Miles of Miles City, Montana. Then, daughters of Advance Domino 20 were bred to his paternal half-sibling, Advance Domino 54, and vice versa. Ever since, Line 1 Hereford cattle maintained by USDA at Miles City descend solely from this foundation. The increase in inbreeding per generation has been kept low as matings between close relatives have been avoided. Line 1 illustrates a successful linebreeding program in which a high degree of relationship (39 percent) to the founding sire has been maintained for 18 generations. Without linebreeding, the relationship to an ancestor 18 generations ago would be less than one one-thousandth of a percent. Nearly all academic and commercial tests that assess production characteristics of individual bulls can be traced to original research with Line 1. Such practical things as the length of feeding period and number of animals required to measure economy of gain in progeny testing were pioneered in developing Line 1 and are now codified in the Beef Improvement Federation Guidelines for Uniform Beef Improvement Programs. Data from Line 1 also contributed to the first estimates of heritability and genetic correlation for beef cattle. Advance Domino 54, a son of Advance Domino 13, from whom all Line 1 Hereford cattle descend. Work with Line 1 has also contributed greatly to the understanding of maternal genetic effects in beef cattle. The influence of a cow’s milk production on the growth of her calf is one well-recognized example. Early on, it was established that in-breeding could have detrimental effects on production efficiency. Crossing Line 1 with other inbred lines of Hereford cattle provided some of the first estimates of heterosis for beef cattle. These early results were complemented by the later observation that heterosis fully offset negative effects of inbreeding. After exchanges of germplasm with the Northern Montana Agricultural Experiment Station at Havre and the USDA-ARS Brooksville Beef Cattle Research Station in Florida, pioneering comprehensive evaluations of genotype-environment interaction were conducted. Calves sired by bulls with parents and grandparents from Montana were found to perform better in Montana than their contemporaries sired by bulls with parents and grandparents from Florida. Conversely, calves sired by bulls from Florida stock were found to perform better in Florida than calves sired from bulls from Montana stock. Today, many cattle producers use results of these studies when they decide where they will obtain breeding stock. 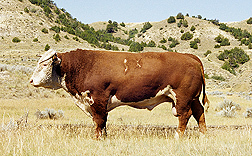 This Line 1 Hereford bull (99375) is the sire of the cow upon whose DNA the bovine genome sequence is based. Line 1 has had a profound influence on the Hereford breed. For more than 60 years, Hereford breeders and commercial beef producers have purchased Line 1 cattle for use in their herds. Today, direct descendants of the Line 1 Hereford cattle bred at Fort Keogh are recorded in almost every state and in several foreign countries. More than half of all Herefords recorded in the United States trace part of their ancestry to Line 1. “Hereford cattle are appealing because they provide a fertile and highly adaptable maternal germplasm,” says MacNeil. 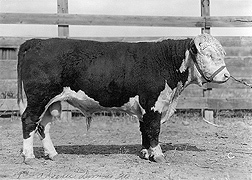 “And mating close relatives, as we do at Miles City, provides us with a continuous test for the presence of harmful recessive genes.” Thus, ARS has provided a secure source of germplasm when the Hereford breed has run into problems with genetic defects, for instance dwarfism and more recently epilepsy. Breeding practices implemented by ARS researchers at Miles City make Line 1 the longest-running selection experiment using beef cattle worldwide. The resulting database provides an exceptional resource for prototyping procedures for national cattle evaluation. Results of this research have found their way into many modern-day genetic evaluation programs worldwide. Research is always moving forward—in this case, in genomics. Increased genetic uniformity resulting from long-term linebreeding makes genome sequences easier to assemble and has uniquely positioned Line 1 Hereford cattle for contributions in future research. A Line 1 bull was selected to make a widely used genomic library, and DNA from a Line 1 cow was the foundation of the recently completed bovine genome sequence. Research with Line 1 Hereford cattle has yielded important animal-improvement information, making beef production more efficient. ARS’s research has also generated useful germplasm that will allow cattle producers to use new technologies to improve their herds for decades to come.—By Sharon Durham, Agricultural Research Service Information Staff. 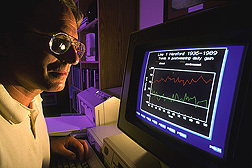 This research is part of Food Animal Production, an ARS national program (#101) described at www.nps.ars.usda.gov. Michael MacNeil is with the USDA-ARS Fort Keogh Livestock and Range Research Laboratory, 243 Fort Keogh Road, Miles City, MT 59301-4016; (406) 874-8213. "Line 1 Hereford Cattle: More Than 75 Years of Research" was published in the March 2010 issue of Agricultural Research magazine.